Lunar colonization awaits a benefit that exceeds the cost. A recent Picture of the Day article discussed the new GRAIL mission to the Moon. Two satellites will orbit the Moon together, with a range-finding system that will detect gravity variations on the lunar surface. On September 14, 2007, the Japan Aerospace Exploration Agency (JAXA) launched the Selenological and Engineering Explorer (SELENE) on a multiyear lunar orbit mission. Otherwise known as Kaguya, a nickname from Japanese folktales, the SELENE spacecraft was built to look for future landing sites and to analyze the surface. The cameras onboard Kaguya were high resolution, so they provided a detailed map. There were gamma ray detectors, charged particle detectors, radar scanners, and infrared detectors, as well. The last mineralogical exploration was in October 2009, when the LCROSS mission revealed water ice and other “useful” materials in the shadows of south polar craters. Lunar colonization has always been a long term goal for NASA administrators. 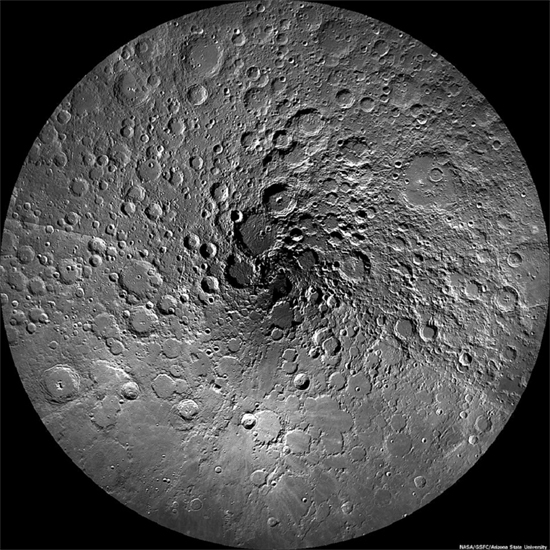 Prior to LCROSS, when the Clementine spacecraft circled the Moon in January 1994, scientists first announced that there was water at the south pole shielded from the Sun inside deep craters and covered by rocks and dust. Carrying the supplies necessary for an extended stay on the Moon onboard a spacecraft is beyond our ability. Launching the payloads into space with all the materials needed for a lunar base would mean a project too costly to contemplate even if it were technically feasible. However, ice can be split into oxygen and hydrogen, so solar panels can create breathable air and potable water. Since there are mountainous regions near the south pole known as “peaks of eternal sunshine,” an energy factory could be built on the mountaintops. The regolith is also rich in compounds that would allow astronauts to make fuel. That way, no fuel except that required to reach the Moon need be carried onboard, meaning a smaller booster. The accuracy of Clementine’s data was called into question, though, because the radar returns came from both brightly illuminated and darkly shaded areas of Shackleton crater, so it was suggested that they bounced off rocks instead of ice. Kaguya’s two sub-satellites, Okina and Ouna seemed to confirm that. Shackleton crater was measured at –183 Celsius, but the Terrain Camera showed no bright, reflective patches indicative of ice. In another turn around, the LCROSS impact released water, methane, ammonia, hydrogen gas, carbon dioxide and carbon monoxide. Metals like sodium and mercury were also seen by the trailing observation instruments before they followed the main impactor into the surface. Water and other volatiles are probably on the Moon because it and the Earth most likely shared a similar birth, with similar chemical gifts. From an Electric Universe perspective, the sparse presence of water is not surprising. The catastrophic nature of the Moon’s experiences over time have removed most of what was once there, leaving only a small remnant. Jupiter and the other gas giant planets, along with their accompanying moons, hint that our Moon might once have also been covered in ice. Perhaps what has been seen in the deep polar craters on the Moon are all that remains.